Sayeed Abubakar is originally a Bengali poet. He is one of the major poets of the modern Bengali poetry. He was born on September 21, 1972 in Bangladesh, a country of south Asia. He writes both in Bengali and English. In Poemhunter.com he is one of the top 500 poets of the world. His poems have been translated in English, Spanish, Arabic and Latin language. Lorena López Velázquez, a Mexican poet, is the first translator of his poems in Spanish. 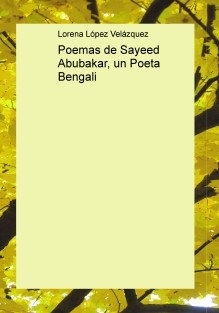 This book consists of 29 poems of Sayeed Abubakar translated in Spanish by Lorena López Velázquez.